Back from the joy of holiday travel and cooking again. In one of the many airports we visited over the past days, we ate at an Au Bon Pain. My daughter is nearly fluent in French and informed me this translates to "Really expensive and mediocre food." She got yogurt and granola. I think it was about $12, but it was a good size and I figured I'd get her leftovers. Thought I'd make my own granola for mixing with yogurt when I got home. Here's one version. I dried some fruit a week ago. 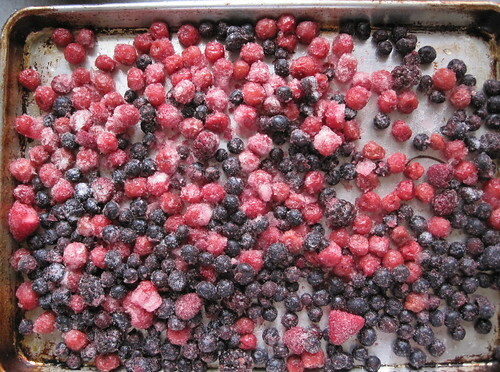 The easiest method to dry fruit is toss a bunch of chopped and/or frozen fruit on a baking sheet, sprinkle some sugar on it and bake at 170°F (the lowest setting on most ovens) until they all look like raisins - soft, but not hard, still moist. 170°F is kind of high for fruit dehydration, but if you don't overdo it, the fruit will dehydrate and not bake. The fruit was reserved. 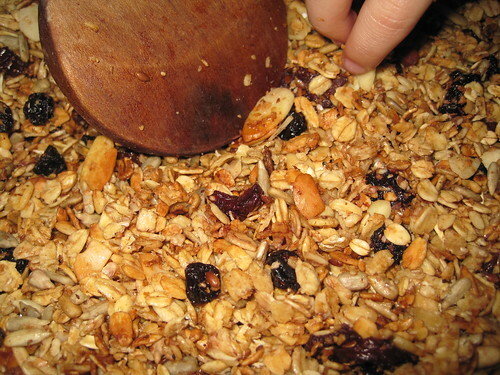 The granola was tossed together quickly. To a large roasting pan (enamel on steel) I added: rolled oats (8 C), wheat bran (1/2 C), oat bran (1/2 C), sunflower seeds (1/2 C), flax seeds (handful) and slivered almonds (1/2 C). On this mixture I poured on a mixture of melted butter (1/4 pound), brown sugar (1 C), trace salt and vanilla extract (2 t) and stirred it all up. I baked the pan in a 350°F oven giving a thorough stir every 10 minutes - set a timer! I did this until the mixture had dried to a near crispy stage (about 50 minutes total). It cooled and the reserved dried fruit was mixed in. Yum. Looks really good; a scoop of yogurt and you've got a meal! Frankie may decide to skip all junk food with this available at home.